Mail Server Type: IMAPIMAP is an E-mail protocol that is used when people wish to always have their messages, including sent messages and message folders, saved on the server. Depending on program configuration, these messages may be temporarily saved on the computer for offline viewing. All messages and folders can be viewed from any computer connecting via IMAP, including Webmail. This option is most recommended for users who connect to E-mail accounts from many computers. 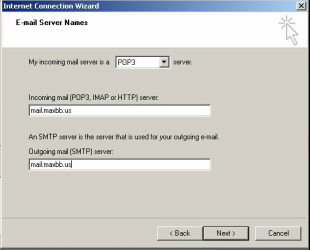 Mail Server Type: POP3POP3 is an E-mail protocol that is used when people wish to have a copy of their E-mail messages, along with any attachments, to be downloaded to their computer for viewing. Depending on program configuration, these messages may be automatically deleted from the server once it is received, or at some future time. Messages sent, moved, or deleted from a computer using POP can only be viewed on that individual computer's folders. They cannot be viewed on other computers connecting to that E-mail account, including Webmail. This option is most recommended for users who like to keep a backup of all their messages. We boast one of the most robust and secure email data centers in the region. It also happens to be the easiest control panel and web-mail access to be available today. Spam Detector that runs 24X7 - processes thousands of emails every day & discrards the known spammer email - so you don't have to. To enter your control panel, simply click here. This page will open in a new window. Type in your FULL email address (you@maxbb.us) and your password. Inside the control panel everything is laid out for you. You can change your password by using the preferences icon. You can read your email by clicking the 'Webmail' icon. Webmail is very convenient - you can send and recieve email from anywhere - as long as you have a web browser and an internet connection. To set up Outlook to retrieve and send mail, the process is very simple. Select the Mail tab and highlight your account you need to adjust. The screen shot is typical of what your finished settings should look like. Use your FULL email address and password, set your incoming and outgoing mail Servers to "mail.maxbb.us"
NOTE: If you are "not" on MaxBB's network Check 'My server requires authentication', you will not be able to send mail but you will be able to recieve, if this is not correct as long your password and email address is entered and is valid. NOTE: Make sure you Check 'My server requires authentication', you will not be able to send mail but you will be able to recieve, if this is not correct, as long your password and email address is entered and is valid.